Everyone knows that you're not supposed to write in library books. (If that rule isn't yet in the Constitution, it should be). Books are expensive to replace, it's not fair to the other patrons to ruin them, blah blah blah. 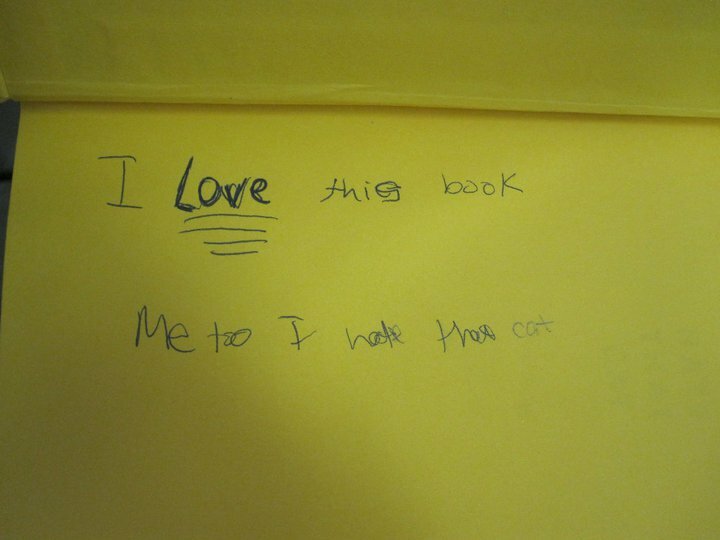 Children's books are especially targeted for defacement since kids seem to prefer writing on any surface that's not actual notebook paper or their homework. 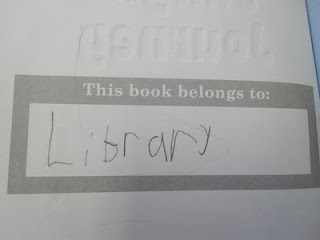 As a librarian, I don't normally condone vandalizing library books. I admit, though, that it can be endearing at times. Exhibit A: "Save Time - Write Book Reviews IN the Book"
It's hard to tell if this was the work of a single vandal or two offenders (results from the handwriting analysis are still pending). I also have to wonder why the kid didn't join a book club or write a blog or tell a librarian about loving this book. However, his/her literary enthusiasm is still appreciated. 'Nuff said. This kid knows what's up. (Bonus points for writing in pencil).